Should state be held responsible for lab chemist’s wrongdoing? 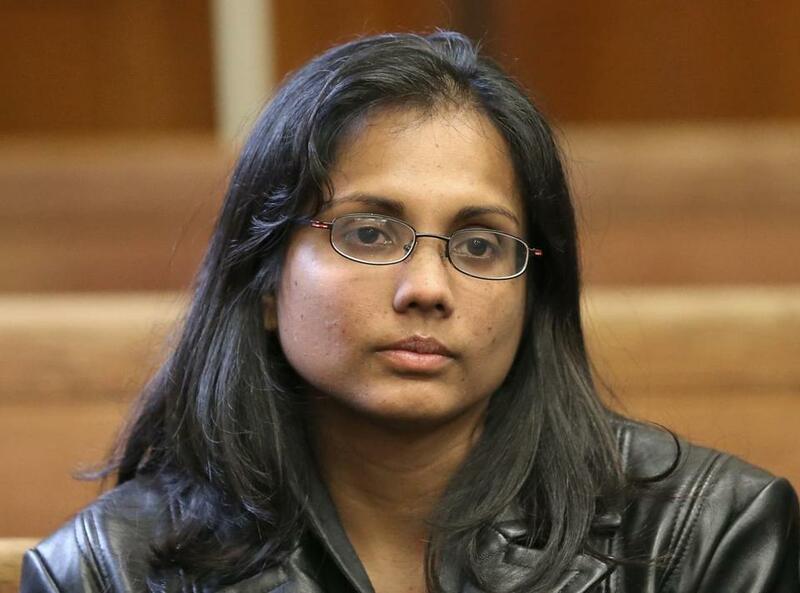 Former state chemist Annie Dookhan was sentenced to three to five years in state prison after she pleaded guilty in 2013 to tampering with evidence and filing false reports. A federal jury could begin deliberating Monday over whether former state officials should be held responsible for the wrongdoing of corrupt drug lab chemist Annie Dookhan, the first case of its kind to question the state’s role in what became the worst criminal justice scandal in Massachusetts history. The case involves a Boston man, David Jones, who had served two-and-a-half years in prison for selling crack cocaine, but who had that case overturned based on Dookhan’s failure to properly test drug evidence. Jones sued several of Dookhan’s former supervisors, saying they were complicit in her wrongdoing and negligent in not reporting her failure to properly test drugs to authorities, depriving Jones of a fair trial. According to testimony in the case last week, Jones was arrested in March 2010 after undercover Boston police detectives said they saw him sell crack cocaine to someone in a car in Mattapan Square. When the man left Jones’s car, authorities found the crack cocaine on him and Jones was subsequently arrested, with more than $600 in cash in his pocket. He denied selling the man drugs. His conviction was overturned following the lab scandal — after he had completed his prison sentence — and prosecutors chose not to try the case again. None of the tens of thousands of defendants convicted of drug crimes after the chemist tampered with evidence should face the possibility of a harsher sentence if they seek a new trial, the American Civil Liberties Union argued. Lawyers in his civil lawsuit are set to deliver closing arguments Monday morning, and jurors could begin deliberating thereafter. The lawsuit, which seeks unspecified damages, names Julie Nassif, who oversaw the Division of Analytical Chemistry within the Department of Public Health at the time of Dookhan’s crimes; Linda Han, who was the director of the crime lab; and Charles Salemi, who was the supervisor of operations at the crime laboratory. The state is not named, though the defendants were sued in their capacity as supervisors. The lawsuit had also originally named JudyAnn Bigby, the former secretary of the Executive Office of Health and Human Services; and John Auerbach, who was the commissioner of the Department of Public Health. Michael L. Tumposky, of the Boston law firm Hedges & Tumposky, said Jones agreed to dismiss the complaint against Bigby and Auerbach to concentrate the case on Dookhan’s more direct supervisors, but he said the case could still expose Bigby, Auerbach, and the state to future liability. “It certainly could reignite interest,” he said. What remained unclear Friday is whether the state, or its insurance carriers, would be liable for any damages. Howard Cooper, a lawyer with the Boston firm Todd & Weld, said there could be a variety of reasons that Jones’s lawyers chose not to name Massachusetts as a defendant, but said the state would likely still be held responsible for the conduct of its employees. “Even though the state’s not a party, these people were agents of the state, employees of the states, so it is the failed system that did not catch what was going on that’s on trial,” Cooper said. A spokeswoman from the state Executive Office of Health and Human Services said officials would not comment. The case is the first civil rights lawsuit related to the Dookhan scandal to go to trial. A separate case was filed earlier against Dookhan, her supervisors, and the state, but the case was dismissed for technical reasons. Several similar cases naming those defendants are pending in federal court in Boston. Dookhan, who worked at the former state crime laboratory from 2003 to 2012, was sentenced to three to five years in state prison after she pleaded guilty in 2013 to tampering with evidence and filing false reports. A State Police investigation showed she had certified substances that she never tested, mixed substances with drugs so that they tested positive, or gave the wrong weight for substances — resulting in harsher penalties for defendants. When confronted by State Police detectives, she lied about it. The wrongdoing was uncovered after the State Police, while in the process of taking over the crime laboratory from the state Department of Public Health, conducted an audit. State officials called Dookhan a rogue chemist, but a state Office of Inspector General investigation later found a pattern of neglect, mismanagement, and poor standards at the laboratory, known as the Hinton laboratory. Among the deficiencies, the investigation found roughly 2,300 drug cases in which test results for evidence were inconsistent, and yet the possibly exculpatory information was never flagged for prosecutors and defense attorneys. Dookhan had been involved in many, but not all, of those cases. Jones’s lawsuit is based on those allegations. On Friday, US District Judge Mark Mastroianni allowed copies of the Office of Inspector General report to be presented to jurors. All of the defendants have since left the crime lab, which was transferred to State Police control. The fallout over the scandal continues, however. More than 500 defendants were released from state prison because their cases were connected to Dookhan, and any case in which she was involved could be subject to review. Initially, investigators identified more than 46,000 cases that could be tied to Dookhan, though that figure could be much higher if the cases had multiple codefendants. Matthew Segal, legal director for the American Civil Liberties Union in Massachusetts, said that his agency, defense lawyers, prosecutors, and the Supreme Judicial Court continue to work on ways to identify all the defendants connected to the Dookhan scandal and alert them that their cases could be challenged. “Our goal was trying to perform a service for the justice system, which means trying to come up with ideas about how to handle the mess,” he said. Milton Valencia an be reached at MValencia@globe.com. Follow him on Twitter @MiltonValencia.